[November 18, 2010] Amanda Jane Mosier of Lawrenceville, Ill., and Jason Andrew Tiller of Russell Springs, Ky., announce their engagement and approaching marriage. The bride-to-be is the daughter of Mike and Donna Mosier of Lawrenceville. She is the granddaughter of Linda Tripplett and the late Jim Tripplett of Middletown, and John Mosier and the late Patricia Mosier of Lincoln. The bridegroom is the son of Russell and Freda Tiller of Russell Springs, Ky. He is the grandson of Joyce Tiller and the late Avery Russell Tiller, and Susie York, all of Russell Springs. The couple will marry at 2 p.m. Dec. 11 at Central Christian Church in Lawrenceville, with the reception immediately following in the church activity center. Amanda is a 2008 graduate of Lawrenceville High School. She attended one year at Lincoln Trail College in Robinson, Ill., and is currently attending Campbellsville University in Campbellsville, Ky. She is employed at Bluegrass Cellular in Campbellsville. Jason is a 2006 graduate of Adair County High School in Columbia, Ky., and a 2010 graduate of Campbellsville University with a bachelor’s degree in journalism. 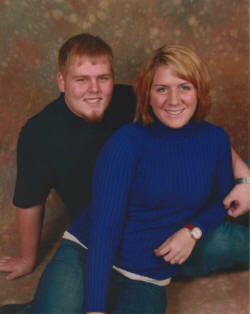 He is a certified youth pastor and is employed at Tantus Inc. in Russell Springs, Ky.